SUBHEAD: Even if RIMPAC didn't harm wildlife or the environment these war games are pointless. Image above: Multinational Marine forces exit a CH-53 Sikorsky Chinook helicopter during the air assault portion of RIMPAC at Pacific Missile Range Facility on July 13th. From original article. Those gazing out to sea from Kauai’s western coast over the weekend likely caught a glimpse of the action. Rim of the Pacific, better known as RIMPAC, the world’s largest multi-national maritime war exercise, continued Saturday through Monday with heavy activity on, above and around Kauai — from helicopters and B-52 bombers flying overhead, to warships dotting the horizon and the sinking of a decommissioned Navy vessel. Capt. Bruce Hay, commander of the Pacific Missile Range Facility, said RIMPAC 2014 has been progressing “exceedingly well” on the base’s ranges. On Saturday, around noon, U.S. and multinational Marines descended at PMRF aboard several CH-53 helicopters and one MV-22 Osprey. It was part of an assault exercise to take back the airfield from enemy forces, PMRF spokesman Stefan Alford wrote in an email. 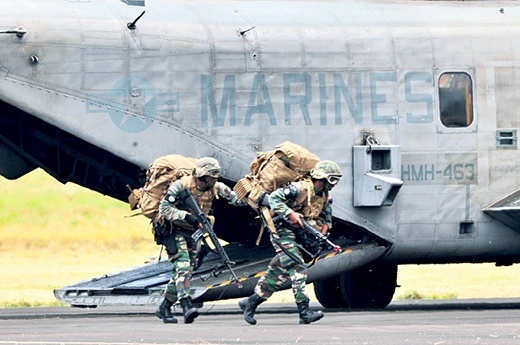 A second company of marines participated in an identical exercise about an hour later using the same aircrafts. Alford said the drills did not include actual engagement as they were designed to train marines’ egress procedures from helicopters. From Polihale State Park on Saturday, observant campers and day-users stood and watched as Boeing B-52 bombers dropped dark-colored objects into the ocean just offshore, causing large splashes below. Later, a small boat followed the aircraft’s flight path and appeared to pick up what was being dropped. Alford said the B-52s were operating on PMRF’s range in support of a Mine Warfare sweeping exercise between Kauai and Niihau, and that the floatable shapes that were dropped are designed to simulate mines. Image above: Still image from video of SINKEX 2014, the sinking of the USN Ogden on July 10th during war games nicknamed the “Naval Gun Fire Rodeo”. From (https://www.youtube.com/watch?v=BNKLGbiXdE8). On Sunday morning, a steady stream of warships — one behind the other — crossed through the 17-mile Kaulakahi Channel separating Kauai and Niihau, heading westward. The approximately 19 ships from various countries, including the United States, China, Norway, Singapore, India, Republic of Korea and Japan, were participating in a “Naval Gun Fire Rodeo,” an exercise to determine most accurate targeting, according to Alford. He said the rodeo consists of ships firing live rounds into a specific set of coordinates, which explains the far-away explosions that could be heard from Polihale Beach. The results of the rodeo are expected to be made during a presentation of awards July 31. Hay is scheduled to attend RIMPAC’s closing ceremonies on Oahu and present the trophy for the event, according to Alford. 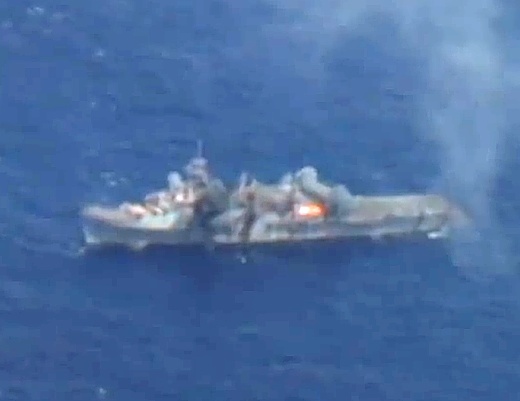 RIMPAC escalated further on Monday, when warships, submarines and aircraft took aim at and sank the decommissioned USS Tuscaloosa at approximately 12:15 p.m., 5,000 feet deep and 57 nautical miles northwest of Kauai, according to a release by the U.S. Third Fleet. Tuscaloosa was decommissioned in 1994 and now rests in a watery grave at the bottom of the Pacific. Alford said Monday’s sinking was the second of two similar exercises, the first of which was held July 10. The drills last through August 1st and take place in the Hawaii Operating Area and several off-shore ranges, including PMRF. Comment by Bjesquire posted Wednesday, Jul 16th, 2014. It's time to start asking real questions about the effects of RIMPAC on Kauai's people and the environment. Many of the politicians tout the millions of dollars it brings to the Islands, but forget these war games cost millions of dollars to stage -- and the taxpayers have to pay the bill -- so how does this actually benefit the people of Hawaii? Because the military is secretive we may never know the true cost to the environment and the people who live and visit here. Even if RIMPAC didn't harm wildlife or the environment, and by the way it is up to them to prove it doesn't, not the other way around, these war games are pointless. In a real war, you can't plan for a battle years in advance and ships aren't going to be sitting ducks in the water easy to blow up. People are sick of the endless cheerleading in the Hawaii press about RIMPAC. Sorry, but this article reads like a press release. There isn't one mention of any opposition to these war games or their negative consequences. If we wanted a press release we could go to RIMPAC's Facebook page (yes, they have one) to read their propaganda. The commander at PMRF insists “The ongoing operations at PMRF continue to be safe, professional and in compliance with all applicable regulations.” Let's see the actual proof. Who is going to hold them to account? We're just supposed to believe him and think it's great? It's up to the military to prove RIMPAC is safe, not we, the people. Do we want Kauai to become a militarized zone? With the Pivot to the Pacific, this is already happening. The Garden Island should ask their readers what they think. The Marine Corps Warfighting Lab, in conjunction with the Office of Naval Research, is currently testing a beast of an amphibious lander. The UHAC began testing on July 9 at the Marine Corps Training Area Bellows on Oahu, Hawaii and it is taking part in the Rim of the Pacific Exercise 2014 which is currently underway until August 1. We have highlighted some of the amazing capabilities of the UHAC below. At full capacity, the UHAC should be able to carry three main battle tanks ashore from a range of 200 nautical miles. Altogether, the UHAC can carry payloads up to 190 tons, almost three times as much as the LCAC. 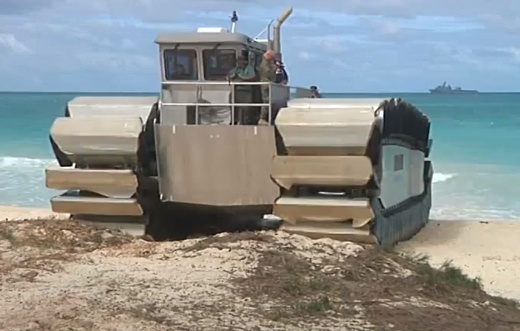 Unlike the LCAC, the UHAC can continue moving while onshore across mud flats, tidal marsh areas, and even over sea walls of up to 10 feet in height. This movement is due to the UHAC’s treads, which are composed of low pressure captive air cells held within foam casings. But the vehicle is limited to speeds up 20 knots, half that of the LCAC, due to drag from its foam treads.